Recently, T-fal provided me with the T-fal Excite Platinum Shimmer Cookware set for free in exchange for my product review. As someone who cooks a lot, I'm always looking for new kitchen tools to try. The cookware set, which costs about $50, has three covered pots and two shallow fry pans. The smaller of the fry pans is 8 inches, and the larger is 10.25 inches and comes with a glass cover. Pots all have glass covers and are 1- and 2-quart handled pots and a 5 quart Dutch oven. The pots and pans all have handles that are oven-safe up to 350 degrees Fahrenheit and a nonstick surface. There were many things I really liked about this set. I like the range of pot and pan sizes, and I'm pleased the 10-inch skillet has a cover. It's a great starter kit for someone who has nothing and needs a versatile size range of pans they can use to cook eggs, warm up soups, or make a full-sized family meal. I also really like that the pans are oven-safe, since many of the recipes I write call for transferring the pans from stovetop to oven. Not all nonstick cookware has this feature, making this a true bonus for an affordable cookware set. I also think the price is excellent, making it a good starter cookware set for people not working with a big budget who want pot and pan basics that are versatile. This is the type of set I would purchase for my son moving into his first college apartment. I'm pretty picky about my nonstick pans. Some nonstick pots don't hold up well, especially after going through the dishwasher, which isn't the case with this set. Both of the fry pans passed what I believe is the most important test you can perform with a nonstick pan - frying an egg over easy. Some pans grip a little too much (especially after a few runs through the dishwasher), and the egg won't release when it's time to flip it. Others have such a slippery surface, it's difficult to flip the eggs without a special spatula because it just slides around the pan. The nonstick surface of these pans, however, was just right. I was able to flip the egg easily, both using a little oil and without any oil in cooking. After a few rounds in the dishwasher, the eggs still flipped easily. I also use my fried egg test to see how evenly the pan heats. On different temperatures, my eggs cooked evenly without any hot, burned, or raw spots. The pan's surface heats evenly. I also like how easily these pans clean up. Even heavily cooked tomato sauce comes off easily with little scrubbing, and the cooking surface doesn't scratch easily. When I cooked eggs, the pans wiped clean with no residue just using a paper towel. The outside of the pots took a bit more scrubbing for baked on foods, but they still came clean. While I liked this set overall, there were a few shortcomings of which I was less fond. The pan is safe to 350 degrees Fahrenheit in the oven, so you can't stick these pans under a hot broiler or put them in the oven for high temperature cooking. The broiler is a bigger issue for me than the higher baking temperatures because I often move frittatas and similar foods from stovetop to broiler for a quick cheese melt or finishing on top. I can't do that with these pans because my broiler temp is too high. I also found the pans fairly thin; they dent easily evidenced by the fact two of the pans arrived dented. That's more of an aesthetic, though; it didn't affect the pan's function, and for the price of the pots, it's unsurprising they aren't as sturdy and thick as more expensive brands. I'm also not fond of the platinum finish, but that's more of a personal color preference than a defect of the product. 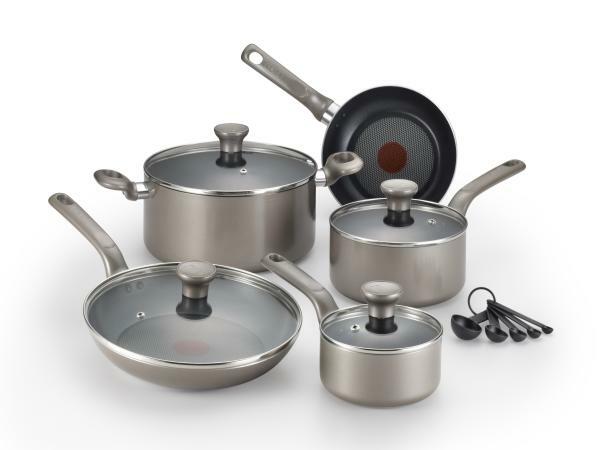 These are a great starter set for someone who needs pots and pans, and they functioned well for the short time I used them for testing. I'd recommend them for people on a budget or for someone just starting out who doesn't require super high performance kitchen cookware. They are definitely worth the price and are a nicely functional budget set of pots and pans.